For Americans born after the 1950s there has been few experiences to compare with the assassination of President John F. Kennedy in 1963. While I was young at the time, I do remember the tremendous outpouring of feeling that pervaded throughout America. This was years before Kennedy's human flaws became common knowledge, and he was admired to a degree no president has enjoyed since, with the possible exception of Ronald Reagan. The desire to memorialize him led to countless streets, schools and other public properties being renamed for the fallen leader. The movement to place his portrait on a circulating coin was born within days of his passing, and the first choice of Congress was the quarter dollar. At the request of Kennedy's widow, who did not want to displace George Washington, a switch was made to the half dollar. As the Benjamin Franklin type had not been in production for the legal minimum of 25 years, a special act of Congress was required to create the Kennedy half dollar. This was passed in record time, being authorized at the end of 1963. 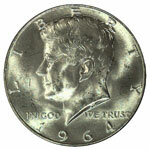 The first Kennedy halves were issued in March of the following year, and 1964 was destined to be the only date coined for circulation in the traditional standard of .900 fine silver. This issue was superseded by a silver-clad copper half dollar coined 1965-70. When this token effort to retain silver as a coinage metal was finally abandoned, the half dollars struck for circulation from 1971 onward have all been of the copper-nickel-clad composition common to the dime and quarter. Though the same basic design elements remain decades later, the Kennedy half dollar of recent years is visibly quite different from the coin of 1964. Gone is the finely sculpted portrait by Gilroy Roberts. It has been replaced by a low-relief bust that, while superficially having more detail, is far less satisfying as art. As with all of our current circulating coinage, the need for increasing the useful lifetime of dies has muted their value as art. The reverse of this coin type, originally sculpted by Frank Gasparro, features the presidential seal. It has suffered less over the years, but it too lacks the character that it once possessed. While nearly all dates in this series have been widely hoarded uncirculated, many are quite challenging to find in gem condition. The silver and silver-clad pieces are typically well struck, but they suffered from contact with other coins during shipment and storage. 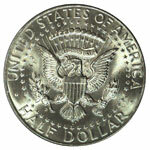 The copper-nickel-clad half dollars coined from 1971 through the mid-1980s are frequently found weakly struck and with signs of obvious die erosion. None of these dates are scarce in mint state, but their overall mediocre quality as made can present an obstacle when searching for gems. The halves of the 1990s to date are almost uniformly sharper, since their relief is so much lower than in earlier years, and fewer pieces are now struck. 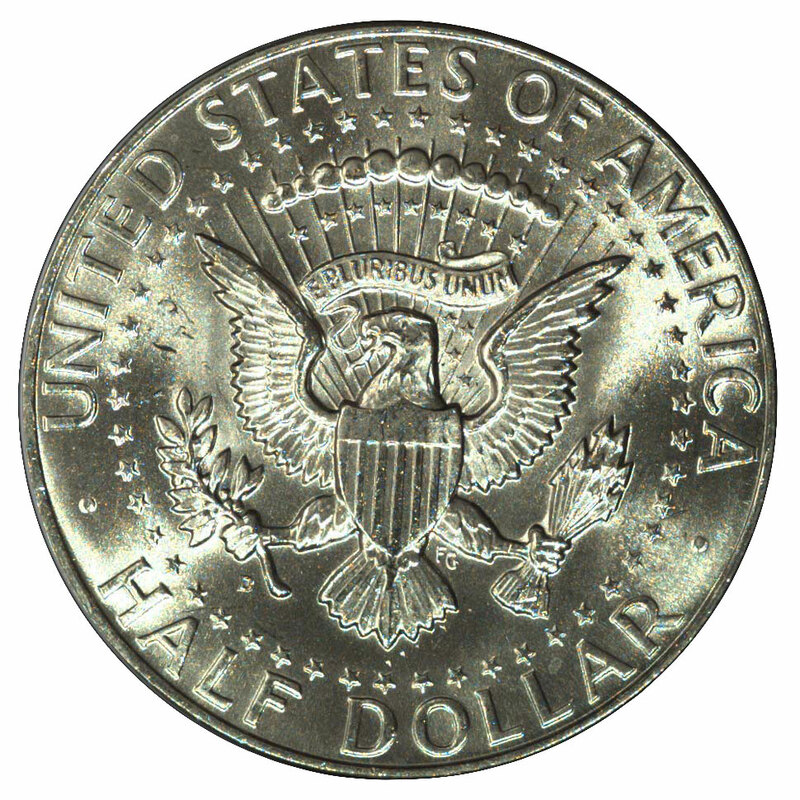 The 1982-83 halves are a bit scarcer than other dates, as the U. S. Mint did not issue its usual Uncirculated Sets during those years. The half dollars dated 1970-D, 1987-P and 1987-D were produced exclusively for these sets, but enough sets were sold to meet the demand from collectors. While the limited mintage of the 1970-D halves came as a pleasant surprise to those collectors who ordered sets, an announcement was made well in advance that the 1987-dated coins would not be produced for general circulation, and sales rose accordingly. No half dollars were minted with the date 1975, as the Mint was then coining pieces dual-dated 1776-1976 for the nation's bicentennial. The circulating edition was in the normal copper-nickel-clad composition, while collector pieces were also made in the 1965-70 silver-clad alloy. All of these pieces are fairly plentiful in gem condition (MS-65 or higher). Since 1992 the Mint has offered proofs of the Kennedy half and the other denominations in both the currency composition and the traditional alloy of .900 fine silver. While the fine silver and silver-clad Kennedy halves may sometimes acquire quite beautiful toning, this is rarely the case with copper-nickel-clad pieces. In any case, most collectors of modern coinage prefer fully "white" coins for their sets. This is true also of the proof pieces and the specimen matte proof issued only in 1998 in conjunction with the Robert F. Kennedy dollar.